When you’re selling information products on the Internet, customers usually expect an instant download of the product unless they’re otherwise notified up front. 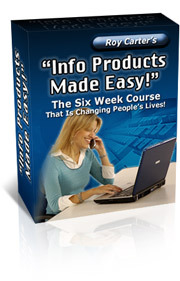 Of course some courses in the information product realm consist of a box of DVDs or audio files that are manually shipped to the customer. If your information product isn’t tangible, then you’ll need to know how to compile it for your customers so that they can instantly access the files and use them at their leisure. The one thing you have to be careful about when creating and compiling information products for online sales is that people are wary of downloading files from others they don’t know. They trust that you’re not going to send them a virus, so make sure you have software installed to protect your computer so that you don’t infect other people unknowingly. If you don’t know how to compile an information product for sale on the ‘net, don’t worry — it’s easy. You can take one of several paths to your success. There are many eBook compilation tools you can invest in, or you can do it for free by creating a PDF file out of your Word document. If you go to a site like https://createpdf.adobe.com, you can instantly get a trial for five free conversions of your information product where the service takes your file and converts it to a PDF document within minutes. Some Internet marketers like to compile their information products in .EXE format, but you have to understand that most consumers are scared to open an executable file on their computer because of the warnings about viruses infecting their computer. Another thing you want to consider when compiling an information product for sale online is security. You have the ability to prevent the product from being printed, shared on multiple computers, or accessed without a password. Always make sure that the buyers of your information products can easily contact you if they have trouble downloading or opening their new purchase. Having quick customer service diminishes the amount of refund requests that you’ll get and helps build the lifetime loyalty of your customers. Is Starting a Membership Site for You?